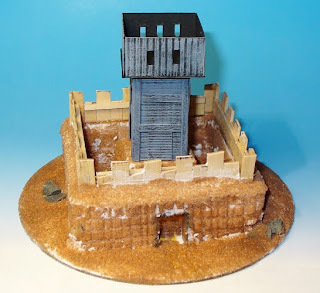 A Roman watch tower is next on my list of terrain for my Early Imperial Roman forces. Again no overly deep research on my part, other than pictures from the book A Gathering of Eagles, about Romes attempts at conquering Scotland, and a quick look on google pictures. Top picture shows the watch tower in its current state, still needs the roof to the watch cabin, more ground work, the tower and cabin are made from ribbed black card which makes painting that much easier, and helps to create the wood planking effect. The walls are built from coffee stirring sticks and match sticks. 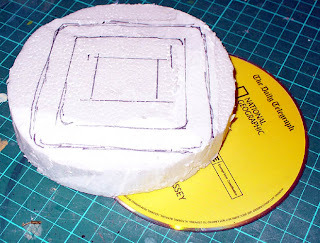 The middle picture shows the soil walls and the base of the watch tower, after being cut from a large block of polystyrene with a craft knife blade. 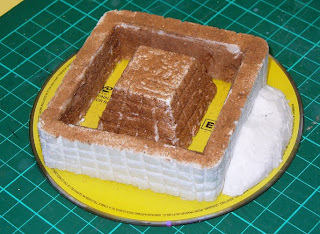 Sand and PVA glue have been put on the tower base and the inside of the walls. You can see on the outside of the walls the soil block effect cut into the walls with the craft knife. The bottom picture shows the solid block of polystyrene with the wall and tower base marked on with black pen. It also shows the CD it was based on.